Test your hearing range by listening to low-, medium-, and high-frequency sounds. 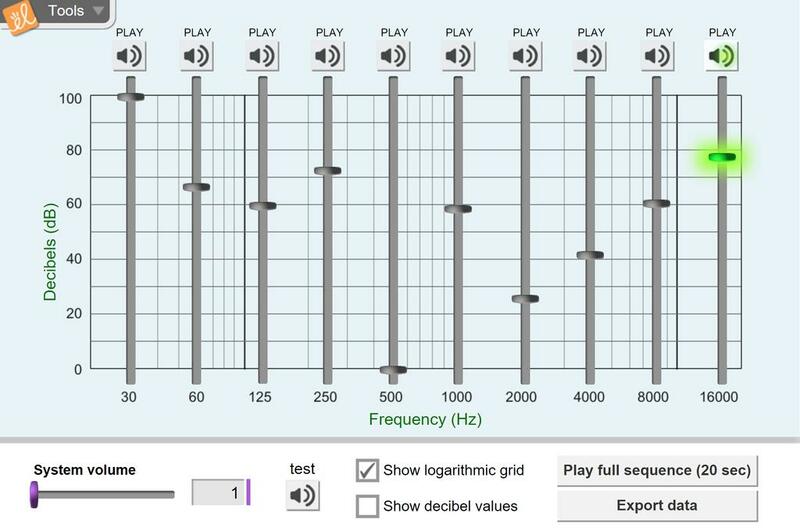 Compare the relative loudness of sounds at each frequency to create an equal-loudness curve. In a quiet room, measure your threshold of audibility for each frequency, and compare your results to others. The volume of each sound can be adjusted. This lesson accompanies the lessons in the teacher's guide. It will take 2 class periods to complete the... (more) entire guide. Students test their own hearing and compare it to classmates as well as learn about sound frequencies. An additional 5 question assessement is included. This guide follows the format of other Gizmo teacher's guides. It can be used alone or with the student ... (more)exploratory guide that was also created with it. Students investigate their own hearing and how it change with age. Students love giving themselves a hearing test.